I was intrigued by the photos because their visual style seemed different than most of the others I’d come across; they were less posed, employed unusual camera angles, and captured their subjects in the harsh light of a flash bulb. Glancing at the back of one of the prints, I noticed the name “A. Fellig” written in the corner. 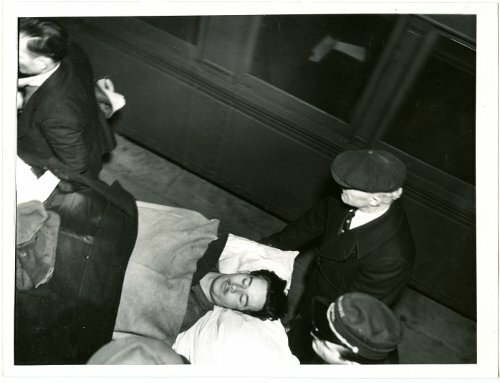 Some of you may know, as I happened to, that Arthur Fellig was the given name of the iconoclastic photographer Weegee, famous for his distinctive photographs of disasters, tragic deaths and other parts of the seamy underside of New York City during the 1930s and 1940s. Could the A. Fellig who signed these photographs be this Arthur Fellig, aka Weegee? 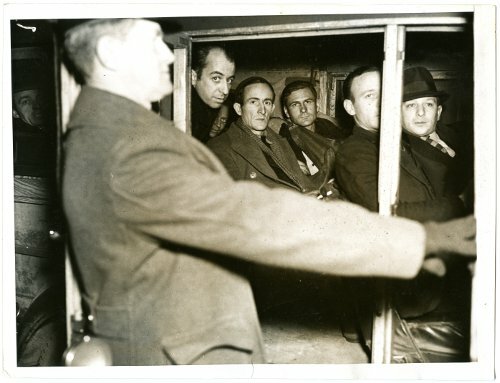 Had I just stumbled upon a number of previously undiscovered Weegee photographs? I was able to contact Chris George, Imaging Technician at the International Center for Photography (ICP), who has been digitizing the ICP’s extensive Weegee archive and consequently is an expert on the collection. Chris responded to me immediately, confirming that Weegee had only started going by his pseudonym in 1937, and sending along a quotation from Weegee by Weegee: An Autobiography, which says, “One day I saw my pictures printed both in the Jewish Daily Forward and the Daily Worker. They had been sent out by the Hearst mat service.” These seemed to both be good signs, and I was optimistic that we would be able to confirm that these were indeed Weegee photos, even though Chris was unable to find matching negatives or any information relating to these photographs in the ICP’s collection. While Chris was looking through ICP’s Weegee archive, I began to investigate whether or not these photographs had ever been published in the Daily Worker. One of the photographs had crop marks, indicating that it had at least been prepared for publication. However, since none of the photographs were dated, tracking down the published photographs necessitated that we identify the event depicted in the photographs. 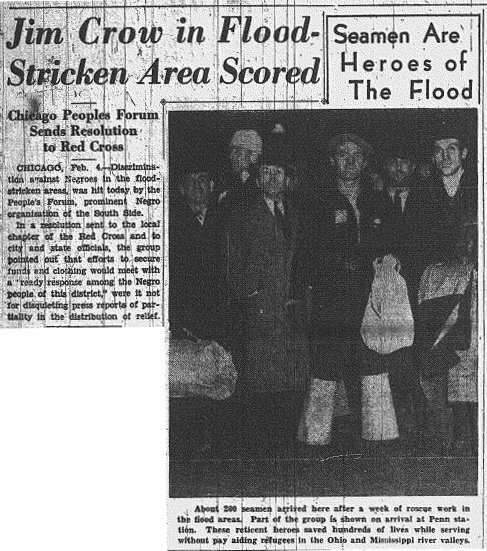 At first, we thought that the flood referenced by the photos was the Great St. Patrick’s Day Flood which took place in Pittsburgh, Pennsylvania in March 1936. Michael Chui, my graduate archival assistant, looked through the microfilm of the Daily Worker from around that time, but did not find published versions of any of the photographs. For a number of months, the investigation stalled, but got a new lease on life when Caroline Partamian, a graduate student in NYU’s Museum Studies department, began to work as my archival assistant. As it happened, Caroline had previously worked with the Weegee archive at ICP, and was able to identify the handwriting on the back of the prints as Weegee’s. She was also able to correctly identify the flood as the Ohio and Great Miami River Flood of 1937, and found the published picture, which appeared in the Daily Worker on February 5th, 1937. Unfortunately, the published photo was not credited. And that’s where we are now. While we couldn’t find absolute verification (a matching negative or other attributed print) all indications seem to be that the photos were indeed taken by Weegee while he was still known as Arthur Fellig. If they are indeed his, this is a historically and artistically significant discovery. I’m not sure that it changes Weegee’s legacy in any substantial way, but it certainly casts the Daily Worker’s process of image-making, photographers associated with the paper, and the visual culture of the Communist Party of the USA in a different light. 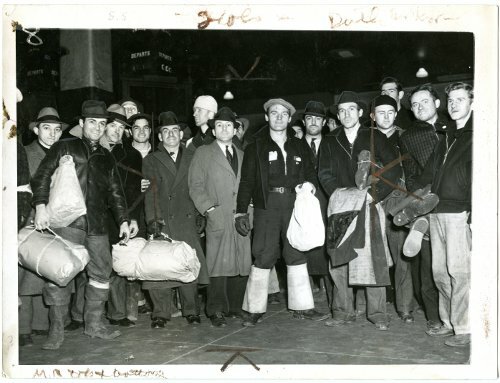 All photographs in this entry come from the Daily Worker/Daily World Photographs Collection at the Tamiment Library/Robert F. Wagner Labor Archives, with the exception of the published photograph, which was reproduced from the microfilm of the Daily Worker. Wow, what a great find – and a great post about it!